516 loyalty points Your cart will total 516 points that can be converted into a voucher of 20,64 PLN. 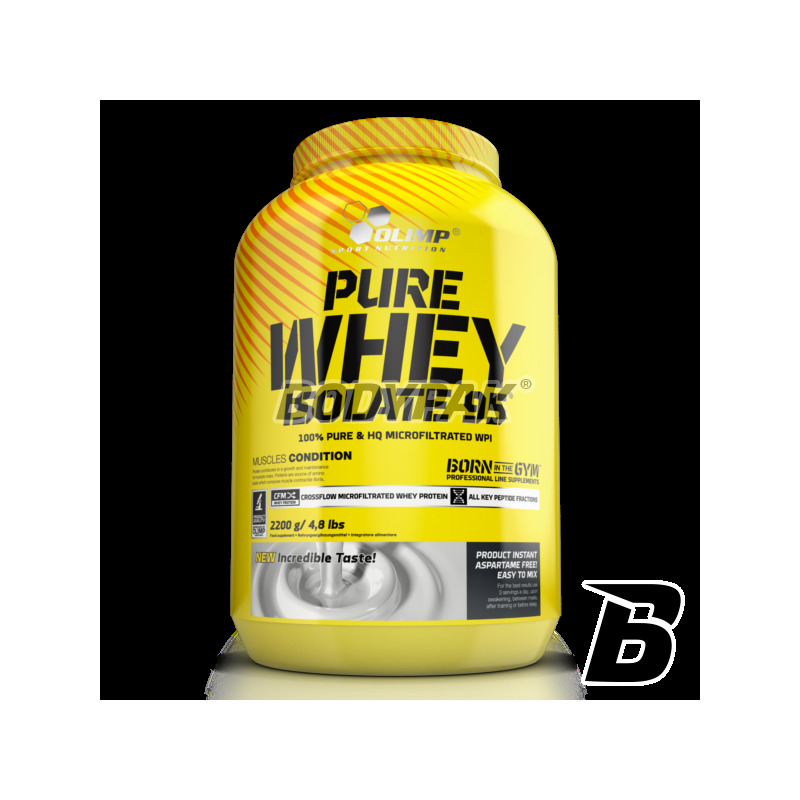 Pure Whey Isolate 95 is the highest quality, lactose-free, pure whey protein isolate (WPI) supplemented with a complex of vitamins and minerals ensuring the normal course of metabolic processes during vigorous physical exercise and increased intake of proteins. 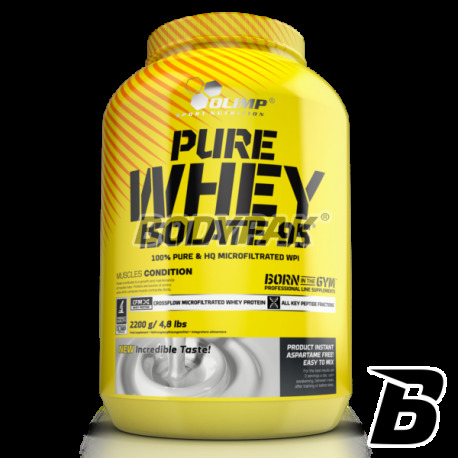 Whey protein isolates are characterized by the highest nutritional value and anabolic activity of all dietary proteins. Obtained in the ion exchange process, not denatured, retain the full structure and activity of functional whey proteins - beta-lactoglobulin, alpha-lactalbumin, immunoglobulins, serum albumin, lactoferrin, lactotransferrin, ceruloplasmin, phosphoglycoproteins, proteases and peptones. The high nutritional value and anabolic activity, isolated whey proteins are considered the most valuable sources of dietary proteins for high-performance athletes and physically active people. High nutritional value is due to the highest possible assimilability determined by their ideal solubility and favorable osmotic pressure of non denatured proteins as well as optimal proportions of exogenous and endogenous to the exceptionally high share of branched chain amino acids (BCAA) and glutamine. The high anabolic activity, apart from the high nutritional value, results from metabolic parameters of whole whey proteins as well as a result of their transformations peptides and micropeptides. These substances act similarly as anabolic peptide growth factors. They facilitate transport of amino acids into muscle cells and stimulate anabolism. They form an antioxidant barrier. They stabilize lysosomes and inhibit the activity of catabolic lysosomal enzymes. They reinforce the cardiovascular, nervous and immune systems. Najlepszy dostępny izolat, jednak w tym opakowaniu zupełnie nieopłacalny. Lepiej kupować w 600g opakowaniach. Zasługuje na 5 ten izolat z uwagi na smak bardzo dobra rozpuszczalność nie tworzą sie grudki , świetna konsystencja i co tu duzo pisac firma Olimp jakość , sama mówi za siebie oraz duża paczka poręczna i na długo może starczyć sami sprubojcie . Swietny izolat pod wzgledem skladu, przyswajalnosci, smaku (czekolada) oraz skutecznosci dzialania. Swietne uzupelnienie diety. Dobrze sie rozpuszcza i jest absolutnie bezpieczny. Polecam kazdemu, starcza na dlugo. Cena adekwatna do jakosci. Izolat bardzo dobry w działaniu jak i cała jakość tego produktu . minusem jest cena ,ale za jakość się płaci wysoką cene! Cena nie przekonuje, jednak za tak wysoką jakość trzeba sporo zapłacić, więc nie może być to minusem. Zdecydowanie jeden z najlepszych izolatów dostępny na rynku.